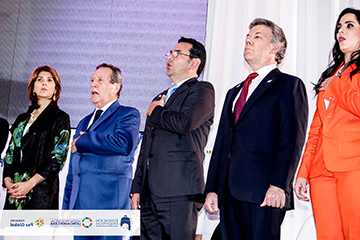 Colombian President Juan Manuel Santos urged collective action and a “victim-centered” approach to resolving conflict in Latin America in an address to 1200 government and civil society leaders in Guatemala City on April 4, 2016.
at an international conference in Guatemala. 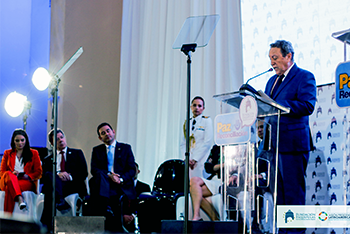 Speaking at an international conference, “Colombia Towards Peace: Transformations and Challenges,” the president cited progress achieved during Colombia’s current peace talks with the Revolutionary Armed Forces of Colombia (FARC) that many believe provide the most hope for success for the country in decades. The conference was organized by the Esquipulas Foundation for Peace, Democracy, Development and Integration, a Guatemalan-based research and advocacy organization, and the Latin American Presidential Mission, an association of former heads of state committed to political and economic reform in Latin America and a project of the Global Peace Foundation. The conference was held to commemorate the 30th anniversary of the signing of the Central American peace agreement Esquipulas I (1986), and Guatemalan peace agreement, Initiative 30/20 (1996), which sought intergovernmental collaboration to lower crime and violence in Central America. In his keynote address, President Santos said that with the necessary foundation of support from the international community and a will for peace expressed by major adversaries, "the real possibility of declaring America–this continent full of opportunities–as a war-free zone is at stake right now." gather for the international conference in Guatemala City. 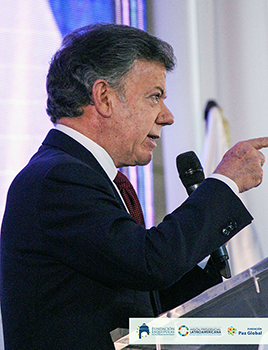 President Santos also highlighted an important and unique aspect of the current peace process in Colombia, saying, "We decided to put victims at the center of the solution in this conflict and this is the first time it's been done this way. Giving back land to its displaced farmers and offering financial reimbursements to victims and millions of displaced families has become an effective way for my government to establish peace." The conference also provided space to discuss how politics, the economy and society can contribute to a culture of peace, and presenters urged a revival of the Esquipulas and Guatemala peace processes. Esquipulas Foundation Executive Director Olinda Salguero acknowledged that the task of realizing peace was complex but achievable. “It is imperative to beat the darkest and unacceptable belief of some that peace will never be possible,” she said. “Today, we millions of Latin American young people can say, we belong to a generation that didn't live through the horror of the war, thanks to the sacrifice of many people and to a few generations that showed us that there are causes, like peace and democracy, which are worth sacrificing one’s life for. I want us to be the generation of peace and reconciliation." Director Olinda Salguero pictured far left. Vinicio Cerezo, former President of Guatemala and President of the Esquipulas Foundation, also highlighted the importance of the anniversary of the Esquipulas Agreements. "Today, the presence of President Santos has to do with the fate and fortune of our future [in Guatemala]. Coincidentally, that dream we had as Central American presidents thirty years ago is embodied today in Colombia: to build peaceful coexistence, achieve justice and forge a new nation and region with everyone's effort, for everyone’s benefit." President Cerezo said that with the current challenges facing the region, the assembled leaders must recreate the meaning of peace. "Peace should not be thought of as the inevitable result of ending war, but instead, the concerted and right making of justice and progress." Santos and Esquipulas Foundation Executive Director Olinda Salguero. Those in attendance included official delegations of Colombia and Guatemala, presided by President of Guatemala, Jimmy Morales, who presented greetings. Representatives from three Guatemalan government branches, the diplomatic corps, international organizations, business and academic sectors, and civil society organizations were also in attendance. The conference was broadcasted by some 125 national and international media organizations on television, online and the radio. The conference followed a series of March forums hosted in Washington, DC by the Esquipulas Foundation, the Latin American Presidential Mission and Global Peace Foundation focused on reviving the Esquipulas Agreements. The organizations will continue their efforts in promoting development, integration and sustainable peace in Latin America.